I have really been writing lately, and I like it. Ever since my friend Sue and I started getting together for coffee and writing (along with critique and plenty of chatting!) I have been much more diligent. Maybe it also helps that I've had to write for the blog, making it easier for my creativity to work or something. I don't know--but I do know that I wrote four pages in slightly more than an hour tonight (single spaced pages, too!) and that I'm pleased with them. Today we collected ten eggs! And I don't think there's been a day in weeks where we got less than four--these chickens are just egg laying machines! Especially considering they refuse to sleep in their coop but instead huddle in one of the bushes (and these nights have been in the 20s, tonight is even colder than that) I can't believe they have it in them to produce the sheer numbers they have been. But they have. And our egg receptacle in the fridge is overflowing with gorgeous eggs in pale blue, pale and dark brown, and an occasional white one. It's so great! So I say it's an ugly part of the homeschooling year because we're heading into March. The first month of spring (nominally)--at least it's the first month where we have hope again that there will be a spring. Spring means a couple of things-- the weather improves and there's more light, which means that we want to spend more time outside and that the gardening can begin (just another thing to fit into the day)...and that the end of the school year is in sight, which means we're getting bored with all the same old routines and book work we've been doing for months on end, and the thought of planning more lessons makes me want to run screaming into the night! Of course there is work that needs to be finished. Both girls have finished the year's work for certain things. Rachel finished her grammar text, Julia finished her reading comprehension workbook and is practically done with a whole year's math. Still, there's history and science and other aspects of Language arts, French and music and physical education/health and art. There's review work and test prep (for Rachel, Julia doesn't have to take standardized tests yet) and projects to finish. It's just that no one actually wants to do it anymore! We'll do it, but we have lost the extreme excitement of September. So my task when I go out to plan the lessons is to figure out how to get some excitement back without abandoning the work we still need to do...this is the hardest part of homeschooling, and why some parents look at me (or let's face it, flat out tell me!) I'm nuts for wanting to do it. Why not just let the school handle everything? If my kids were in school, this wouldn't be my worry, the teachers would handle everything. Which is completely true--except for the actual handling it part. The making it interesting part. The part where the kids want to learn and are excited about doing it part. Which is why this burden is a challenge I (mostly) look forward to. This morning after Emma's dance class, Matt and I were having coffee in the dining room. Rachel was out most of the day today, first with friends at a 4H service project meeting, then ice skating with our neighbors. Julia was playing at the computer, and Ben was playing a quiet game, so we were enjoying sitting with our coffee and talking about what we were going to do for the rest of the day. Then Emma asked if she could have tea. Matt went and put on the kettle. The sugar was already on the table because of coffee, and there were spoons laid out, too. So he just got her the little mug she likes to use, with an English Breakfast tea bag--you must be careful to let her unwrap her own tea bag, unwind the string, and put it in the water or she won't drink it...once the water boiled, he poured it for her, and she dunked the tea bag and added 2 spoons of sugar, which is all we will allow her. As she waited for it to steep, her eye fell on the thermal carafe we keep the coffee in so it will remain hot without cooking away. We have started covering it lately with the tea cozy our sister-in-law, Donna, made for Matt several Christmases ago. "And you have the tea sweaty on the coffee pot," she observed sagely. At least she got the concept that the name of it was something about keeping warm! WE GOT OUR FIRST (real) SNOWFALL OF THE WINTER!!!! 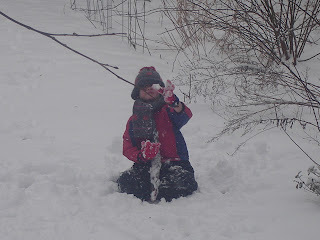 We are so excited; so excited that Julia, Ben, and Emma went outside to play in the 4 inches at 9:00 AM. And I joined them at 9:40, a few minutes after getting up. The snow was great. It's light, puffy packing snow, so Julia and Ben were having a snowball fight. Emma did not join that one, needless to say. 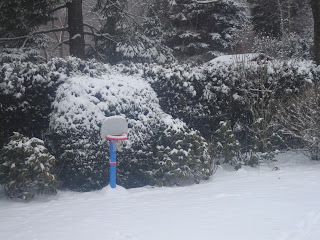 So, here are some pictures to show you our snowfall! Did anyone see the lunar eclipse last night? When I headed out to my friend's house last night I thought it was going to be too cloudy to see it, and I was sad because I love stuff like this. Then we had the meeting, and of course it went later than we'd all expected (till 11; since we started at 7 we didn't think it would be much later than 10, which is I think when the eclipse began) so we thought we'd missed it. Being a bunch of homeschooling moms, we were all quite upset by this! But as we headed out to our cars I happened to look up--and there it was! It wasn't total anymore, but it was still an obvious eclipse. It looked like a crescent moon, but then you could see the rest of the moon in shadow with a ring of light around the outside. It was very pretty and there were stars (planets maybe?) scattered right around the moon, crystal clear. I just wish it had been warmer than 15 degrees so I could have stayed out to watch it a while! I did take a few photos after I got home, but honestly I'm not sure you can tell it's even the moon--I'll have to put it n the computer to check, because on the camera screen it just looks vague. I hope you got to see this lovely sight! This morning when it came time for Ben to read me a story, he deviated from the plan. Usually he gets me a story from the library basket (so that I know it isn't a story he has memorized) and reads it to me, with me giving help as needed. "Mom," he said seriously, "I want to read a chapter from `Harry Potter and the Sorcerer's Stone.' "
I should say here that he has seen most of the movies, and every night Matt reads from a chapter book way above his reading level, such as The Hobbit or The Chronicles of Narnia series. Ben's dearest wish is that when they are finished with Narnia they will begin the Harry Potter books. I thought of saying no, because I knew it would be way too hard for him. He is doing really well, but by the end of a story book he is done. And it is just a fact that a book written for young adults (or at least much older kids) is too dense for a 5 year old to get through. So instead I suggested that he read one page. He read about a half a page, and he did pretty well. 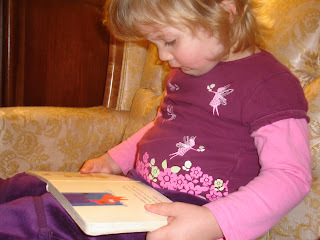 But after that he agreed that he'd rather read a story book, and happily chose one. I think that even the size of the print makes a huge difference to a new reader, and the number of words on a page. But I was proud of him for trying! Today while Ben and I were doing schoolwork, Emma was playing with Julia's little stuffed dog named Chocolate. She'd taken Sophie's leash and wrapped it around the legs of one of the dining room chairs in a zigzag pattern, and she was chattering away. I wasn't paying much attention because Ben was writing words and I needed to pay attention to help him spell them. Finally, she came up for air to tell me about her game. "Mama, Chocolate was bad, and he had to go to jail. 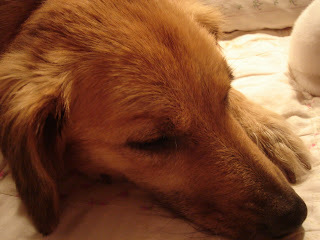 I made him a web where he has to stay, and I won't let him go," she explained, holding up the offending pup. "Well, I guess that's best, if he was bad," I said solemnly. "Yes--and this is his guard," she went on, and held up the fluffiest pink bunny in the world. "And she is holding a buttery Easter carrot." OK, cool thing! I was over at my friend's house the other day. His mom was on the computer, which is right in their living room. She said, "Come look at this!" I did. It was a website called "FreeRice.com" Apparently, it is a website that has you look at a word, and then choose a multiple choice answer. One of the synonyms is right. The reason it's called FreeRice is because for every question you answer right, the UN World Food Program donates 20 (real!) grains of rice to homeless/hungry people! Just from playing an online game! And it even keeps track of how many grains of rice you've donated so far! Cool, huh? This doggie just begs for a kiss! Is spring ever going to come? I have faith, though. It's about 57 degrees outside (although it's also raining and is very windy...) and I can smell spring in the air. Now if those darn trees and flowers would only cooperate, I'm sure we could take a picture and fool you into thinking that it's spring in the middle of February! Weather (if you're listening): GIVE US SPRING ALREADY!!!! The most effective way to do something is to do it. We give the kids gifts on Valentine's Day, rather than just cards or little trinkets. I don't know exactly why we started doing it, but I enjoy it because in my mind, winter is long and dreary and it adds some fun to the dark days. Besides, I usually shop for the gifts while I shop for Julia's birthday, so it's easy. This year, Ben got an ant farm. One of those really cool ones with the green gel that they live in and a light that will make it all glow in the dark. It even has ports for rubber tubing so that if you have nothing better to do you can buy a few of them and hook them together! You have to send away for the ants, and in a few weeks they will send 2 dozen Western Harvester ants (which they caution should never be handled as they "bite and sting," but, they quickly reassure, also make the best tunnels and societies to observe!) that you have to stun in the refrigerator for 15 minutes before you set them into their new home. Ben is very excited, although he was suitably disappointed that he'll have to wait for the honored guests to arrive. I am kicking myself--when I bought this 2+ weeks ago I thought I should send away for the ants immediately, but then decided not to because I'd have to pry the box open, which would make it look bad when he opened it. If I only had, the little buggers would be arriving soon! Julia got a bug habitat for her birthday, so between the two of them they should be all set! (The interesting thing here is that I absolutely detest bugs of any kind--so you can see the devotion of a homeschooling mama here! For Emma, I got a Dairy Queen ice cream set. Of course we have loads of toy food, but most of it dates back to Rachel's toddlerhood, and is showing its age. When I saw this set, complete with strawberry shakes with straws, banana splits, a 6 piece cake with removable candles and a shiny cake server, ice cream sandwiches and pops on sticks, soft serve ice cream cones and even a basket with paper doilies that holds strawberries and squares of chocolate bar--I knew Emma would have a ball. She immediately set up a restaurant and the kids paid her with plastic money we use for math practice. She fed her dolls and bunnies, had a birthday party, and served me endless slices of cake all day. It was a great gift, if I do say so myself. As for Julia and Rachel--they were thrilled with a bracelet kit (Julia has already made herself a beribboned horse charm bracelet, plus one for her best friend) and a journal, special pens and a new book to read, respectively. We also got goodies from Grandma Barbara via mail, and chocolates that Matt picked up when he was shopping for me, and Rachel surprised us all by buying bubble gum for her siblings and fancy chocolates for me and Matt from her babysitting money....so we all had a lovely Valentine's Day. Hope you did too! It has been pouring all day today, NOT snowing! Last night, it began to rain even though the thermometer said it was 20 degrees.. So by morning all the snow was melted. Needless to say, we aren't happy at all. Today we had to go to a morning program (leaving the house at 9 AM...), stayed out until noon, grabbed a bite to eat, did some schoolwork, and rushed out to our 4-H meeting at 1 PM. All the while, it was pouring rain; it looked like someone was literally pouring buckets down on top of us, the houses, the car, and anything that came into its path. Late this afternoon it began to snow. We kept glancing out the window, our spirits buoyed by the fact that it was actually sticking, but not quite daring to hope. 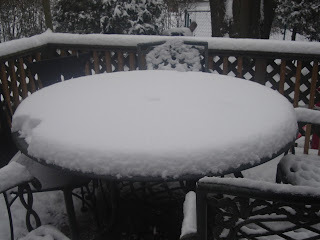 Soon the patio table was covered, the trees started to whiten, the cars became humps--and Matt was sent home from work early...now, it is still snowing, and everything is completely covered. 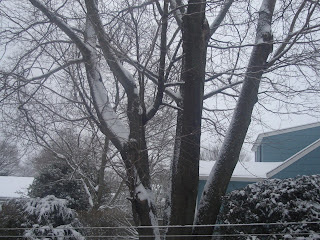 There's barely an inch out there, but it still falls, and our hopes are growing. I went out to take the recycling out to the curb, and noticed that the sky is that odd bright cloudy color that it is during a snow, that the air is crisp and silent, and that the flakes are coming down even faster than it looks like inside. We will take photos tomorrow. Though, unfortunately, we have activities in the morning and the afternoon--it figures, less time for the kids to frolic. Hopefully it will snow and snow and snow, enough to remain at least a week. It really is something that lifts the spirits in the dull gray winter. A little snow goes a long way, but a lot would be even better! Last night was a wild one. The winds were howling around the house, and were blowing very strangely, in fact. We keep the chicken coop door propped just the smallest bit with a milk crate--enough for them to go in and out, but mostly closed so that rain can't come in and the hay doesn't blow around, and so drafts are kept to a minimum. 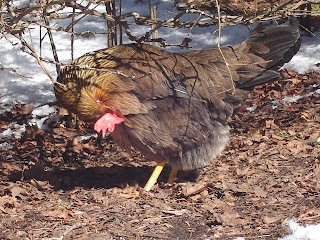 (If we had normal chickens we would close them in the coop every night, but they roost most of the time in bushes, so we just leave it accessible all the time in case they decide to grow a brain and go in!) The point of telling you this is that while Matt and I were watching TV last night, we kept hearing a thumping noise in the yard, clearly related to the wind. We discovered it was the door to the coop! So imagine this door, open at maybe a 25 or 30 degree angle pointed at the ground, somehow being blown open in the wind--and not just once, but over and over again! All night the wind rattled around the house. The awnings over the west facing windows (which are rolled tight during these months both for the winds and so we can get every bit of light possible!) were rattling and creaking, the wind moaned, the door thumped. It was something like 10 degrees with under zero wind chills. A nice night to snuggle! But this morning--our back door was completely sheeted in frost. The very thick frost, not the kind that melts at a touch of sun, but the kind that you'd have to really scrape at to get off. The kind with swirly fairy designs in it. The kids were mesmerized...but it was so cold I had to remind them that we needed to shut the wooden door to keep out the drafts! It was so pretty, though. After yesterday, when I was sick, it is nice to be mostly among the living again. I have to say that Rachel took over the house yesterday and did it well--she did lessons with Ben and Julia, then her own. She corralled the kids around, doing their chores, playing outside or quietly so I could sleep. She and Julia kept my sock full of rice (so very useful for those aches and pains!) nice and hot in the microwave, which was the only thing that kept me even a bit comfortable. They kept offering me food, which I couldn't eat or even smell--I couldn't even sit up for more than just a few moments. It was kind of brutal. The entire day I ate half a piece of toast and some of a small bowl of Wheat Chex--both of which I felt hungry for and both of which tasted like sawdust at best. I did drink some Coke to settle my stomach and a glass of orange juice, and at Matt's order chewed a kid's vitamin up. But let's just say it was not a happy day. Compared to that, then, today has been leagues better. I slept late, but had some coffee and orange juice with Matt. I even managed an omelette for lunch, and some crackers with 2 pieces of cheese and a handful of grapes for a snack after Matt and Julia returned from the grocery store. Matt and Rachel are in the kitchen now, making dinner--beer battered fish and oven baked fries, plus green beans. Fried fish is not something we eat often, but I think Matt is trying to tempt me back to food. Hopefully it won't prove too much for me, because I know it will be delicious and I am looking forward to it. Hopefully tomorrow I will be 100%; because after two days of me being out of commission the house is beginning to show it...Rachel scooped the litter box this morning, and complained bitterly at how filthy it was--I pointed out that I generally scoop it 2 or 3 times a day, and she just looked blank! Well, last night my mom wasn't feeling that good. She was achy, nauseous, and feeling bad in general. I hoped that she would feel better in the morning, maybe even better enough to go to our History Club. She's stuck in bed, with all the symptoms from last night. I am the new Official Nurse. Wish me luck; I also have to take care of our schoolwork!!! I think I forgot to mention that in the end Julia decided that she does want to play softball...so all three older kids are signed up for Little League, and I am dreading the entire thing. I hope that I am wrong about how horrible it's going to be, but I don't think I am. Because last year it was awful having only one team to deal with. Now there are three. Hence, it will be three times as bad--unless you believe that it will be bad exponentially, which I do! But maybe I'm just being a pessimist and it will be the most fun experience I can ever imagine....yeah, right! Yesterday we had a field trip to the Long Island Science Center right her in town (which I always think is a riot--such a grand name for a very small science center! But they do run nice programs.) It was truly an historical field trip for us. All four children were in the program! I was left by myself to chat with the other moms while all of my kids went in and learned about chocolate! It was really so nice. On the way there, I told the kids that I wasn't sure if the program would be all ages together or split into different age groups, but whoever was with Emma needed to keep an eye on her, to help redirect her if her attention flagged, to help her follow directions, and to make sure she wasn't talking or interrupting. We arrived a bit early, so the kids were allowed to look around the museum and play. When the teacher came out and called the kids into the program room, Ben took Emma's hand and led her inside. It was so sweet to watch, and I knew I didn't have to worry about Emma if Ben was going to be her protector! Last night my friend Amie and I went out to the movies to see "27 Dresses," something neither of our husbands had any interest in. We went for drinks afterwards and were talking about life in general, and the subject of my recent coffee emergency came up. She told me something her husband does that makes complete sense and would have saved my sanity on Tuesday. He fills a sandwich bag with coffee beans and puts it at the back of the freezer. That's it. An emergency coffee stash so that you can never be completely out of coffee again...brilliant! Today is the Presidential Primary election here in New York. Anyone who knows me knows without question that I am a Democrat. Without revealing who I voted for, or giving any reasons why one candidate is better than another, I just want to say that no matter who wins this round of the election, I am proud to be part of this historical election, where Democrats across the country are choosing between a woman and an African American. All I can say is, it's about time!! I remember the good old days, when one of those really irritating battery powered toys ran out of batteries and I would hope that the kids forgot they used batteries, or would simply pretend that we were out of batteries and tell them I'd have to get some more "the next time I went to the store," which of course never happened, or at least didn't happen for weeks if it was a really beloved toy. No more. Genius mama that I am, I gave Ben a science lesson a few weeks ago that involved putting things together and taking them apart. We had a flashlight with batteries, the bike lock with the cable and the padlock and key, a screwdriver and screws, and some latch fasteners. That was all I could dig up on short notice, though the possibilities are endless. The whole point of it was for him to figure out how it worked, and to practice using the screwdriver, and to notice that the flashlight wouldn't work if the batteries weren't in correctly. This lesson was successful because he LOVED it--not because he didn't know how to do any of it. I was surprised that the flashlight worked the first time he replaced the batteries, and he had no trouble with the screwdriver or anything else--but what he loved was practicing. I also found this interesting because the girls would not have cared one bit for this kind of thing when they were five. Learning sometimes has its drawbacks. I am out of coffee!! Anyone who knows me knows that this is just about an impossible state of affairs! I mean, this is just not funny, people. I don't even have enough for morning coffee, which is just unacceptable. Although I have to say that if I must be out of coffee, tomorrow s a good choice, because we have story time at 10:00, which means I often don't have coffee before we leave (sleep edges out coffee just a wee bit!) and so we'll just stop by the store after that. Still, this is something that does not happen. Ever. And the next time it does, I may be a grandma or something! "And," he continued, undaunted, "`brary' means a beautiful place. So `library' means a beautiful place you find books!" Well--he may not have it correct--but I still couldn't have explained it better! Today I spent nearly five hours working in the yard. I never raked all the leaves out of the yard this fall, because we got so busy with the painting. It has bothered me all winter that I never did that chore, along with the other major chore of not pulling up the lily bulbs. So today I decided to do it. Matt brought up the fact that the leaves are actually protecting the plants, but I had to counter the argument--we are going to have more painting to do in the spring, and if I don't tidy up the yard now I will be so far behind that I'll never get it done. Plus we have a whole compost bin full of good soil, so I will spread that over the now-clean garden and that will protect the plants. One catch--we didn't have any lawn bags...so rather than go to the store (on Super Bowl Sunday--are you kidding?!) I used kitchen trash bags. I raked out the garden as well as around it by the fence, the patch by the shed door, under the Buddha bush, the patio around the chicken coop, by the garden swing, cleaned the chicken coop and the back patio, and raked up the giant pile of leaves in the middle of the yard that the kids raked in the fall but didn't pick up--so instead they have been jumped in and raked twenty times or so. 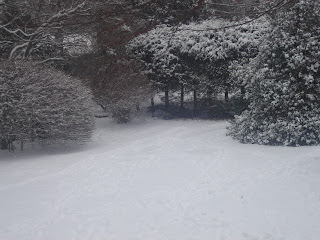 Please note that this is only half the yard--albeit the most important half--I didn't get the whole side of the yard where the pine tree, rhododendrons, lilacs, rose of Sharon, spirea bushes are, around the compost bin and under the forsythia at the back of the yard or the holly tree. However, the yard looks much neater and cleaner. Everyone joined me after an hour or so, which definitely sped the process up. 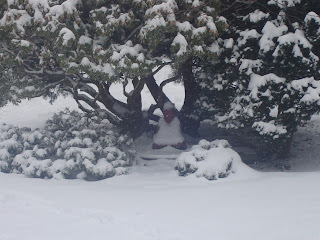 Emma carried sticks to the fire kindling bucket, Ben tilled in the garden to get the bulbs loosened, Rachel and Julia held bags open, filled bags themselves, and hauled leaves to the curb, refilled the Buddha pond and pulled unwanted plants up by their roots. 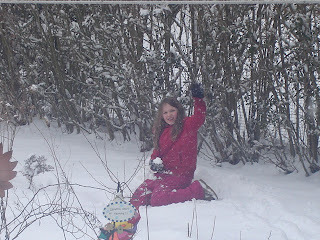 All the kids tidied up the outdoor toys and played with Sophie, who was excited that we were all outside. We also had the music going--the Beatles, Jewel, Paul Simon and even Madonna, so I was happy. I have decided that the patch by the shed will become the vegetable garden. I don't know why this didn't occur to me before--it's small, but I can fence it off very easily and keep the chickens from destroying our plants, plus it gets wonderful sun. I pulled the daisy-ish flowers out by the roots, though I couldn't bring myself to dig the daffodil and iris bulbs out. I have asked advice about whether I can leave those in place along with the veggies. Since it's a small area I think we'll stick to tomatoes, peppers and cucumbers, maybe one other thing. I have had so much more success with flowers and local produce is pretty cheap in the summer anyway. The vegetables are really more because I don't feel like a "real" gardener if we don't have some vegetables, plus the kids get such a kick of eating what we grow. I can practically smell spring! You may have read that I went to M.I.T. In 1982 I filled out a Who's Who survey with joking responses, and they never bothered to check the facts. The mantle has now moved on to Emma...that is, dance class. Rachel was our most serious dancer. She took classes from the time she was 4 until the spring after her 10th birthday (then she wanted to move on to piano lessons and horses. There is only so much time in the day, not to mention money for extracurriculars!) Julia took less intense classes from the time she was 3 until last year--she also wanted horseback riding lessons. I say her classes were less intense because unlike Rachel, who took her classes at a studio, with classes every week from September till June and a recital to perform in, we found a better option for Julia....classes through the town. The first thing I love about these classes is the price. Rather than $45 a month, plus registration, money for photos and recital costumes and tickets-- expensive! --classes through our town are just $35 for 7 classes! No photos, registration fee, or recitals. And that brings me to the second thing I love--each session is 7 classes long, and then there's a 6 week break. This is awesome for small kids, gives them a chance to try another activity and gives us a break! The third thing (and probably the best thing) is the teacher--Miss Gail. Miss Gail has been teaching these classes since she was a sophomore in college, and is now in her mid-to-late 20's. She is wonderful with the kids--a dancer and choreographer, she knows what she's doing, but she is sweet and kind, soft-spoken and always smiling. The girls (the classes are pretty much all girls with maybe a boy once in a while) just flock to her. Julia just adored her when she took the class. She couldn't wait to go, she couldn't wait for breaks to be over, and she always wanted to hug Miss Gail and tell her about new adventures. Now Emma is in the class, and although she is bizarrely quiet there (she practically doesn't speak at all, and if you know Emma you know she is not the silent type!) she loves everything about it and really pays attention. Today was the first week I took her to class, and I watched Emma watch Miss Gail carefully to see just what she was doing, and then imitate her as closely as she could. It was so cute to watch. And I knew the entire class, since she does the same activities and songs with every 3 year old class,so it was a kick to see Emma do the same things Julia used to do. Wow--Julia is 8 today! I can't believe it. I was practically used to her being 7, though even that seemed kind of old, but 8? That just seems ridiculous. As it happens, she went to the doctor today, because she fell on her bike on Monday and the cut ended up infected. We tried taking care of it ourselves (and boy, was that charming!) but last night we got worried that it would worsen over the weekend and we'd end up at the emergency room, and also she was in pain. So after we drained it we called the doctor he sent us out for an antibiotic at 9 pm, and told us to come in today. So poor Julia had to be at the doctor's on her birthday. The good news is, he says it looks fine and the antibiotics will take care of it. And he was able to give her the checkup we'd scheduled for next Saturday so we can avoid returning. She is now 53 inches tall! And she gained 18 pounds over the last year! Just incredible. We knew she'd gotten bigger, but this is just crazy. She opened her gifts before Matt went to work, and loved them all. Rachel gave her a stuffed pony and a model horse. Grandma B. have her a watch and a beading kit. Liz and Peter (friends from Matt's office) gave her a cool scrapbook where she can put photos and mementos. And we gave her a stuffed piggie, new furry pink slippers, horses in a barn, a set to paint her own plate, bowl and mug that you fire in the oven, and a bug habitat with night vision light in it. It even has a tree that you can stick real leaves for food in, and a pond for them to drink, and a background scene to make it look like a forest, plus a magnifying glass to check them out with.